Fitness expert Renée Vincent advises on the importance of movement for toddlers and how, as parents, we can serve as their first coaches. Development happens dramatically in the first 1000 days. During this time a child transitions from being a newborn with only basic survival reflexes to a fully-fledged preschooler who can run, jump and climb. As a physiotherapist, I observe and analyse movement daily but nothing prepared me for the joy and wonder I have experienced watching my son grow. I found it fascinating to see from birth his innate drive to move, to repeat things over and over, to seek new experiences, to take risks and to stretch his boundaries. Are you unsure about what level of Or perhaps you’re wondering how on earth anyone manages to even get off the couch while pregnant, let alone continue their fitness routines. Mounting scientific evidence shows us that exercising during pregnancy has important health benefits for both mother and baby. The Journal of American Medicine Association and BMC Pregnancy and Childbirth both report that physical exercise during pregnancy helps reduce the risk of gestational diabetes, pre- eclampsia and excessive pregnancy weight gain for a mother. YOU’RE NOT JUST A FAMILY, YOU’RE A TEAM! 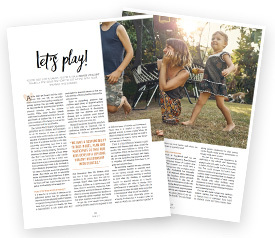 RENÉE VINCENT SHARES A FEW IDEAS ON HOW TO GET ACTIVE WITH YOUR WHANAU THIS SUMMER. As the days get longer and the trees start to burst with new life, we naturally feel more like heading outside and getting moving. You can really capitalise on this impulse by planning your family’s physical activities over the summer months. While many families already make time for physical activity, in the rush and bustle of modern life, it is easy for some members of the family to not get the exercise they need for good health. Breast are the unsung heroes of motherhood but often soldier on without the support they need. Renee Vincent explains why and how we should show them more love. We all recognise that breathing is a vital function, but many of us do not realise just how important it is to breathe well. It is easy to take our breathing for granted – we’ve literally been doing it since the day we were born. But when we don’t breathe with an optimal pattern, we become vulnerable to uncomfortable physical and mental symptoms. To quote breathing expert Tania Clifton-Smith from Breathing Works, how we breathe affects “the way we feel, the way we look, the way we move, the way we function, the way we present ourselves and the way we speak”. Some parents are wide awake at night, even when their children are peacefully sleeping. Physiotherapist Renee Vincent explains why cleaning up our sleep hygiene is a helpful and healthy idea. In the Winter OHbaby! Renee writes about Exercise during pregnancy and why it is the best medicine. If a friend told you about an inexpensive wonder drug that adds years to your life, prevents and treats dozens of diseases and even improves your quality of life, I’m sure you would be keen to know more about it. You might wonder what the catch is, only to be amazed to find out that this drug has very few negative side effects when taken in the correct dose. A gentle stretching routine can help you reconnect with your hardworking body and ease tensions common to motherhood. OHbaby! fitness expert Renee Vincent explains how. During pregnancy, your posture and movement altered completely. And after birth, they changed again. Your new role as a mum may be exciting, and you may nd plenty of joy in caring for your new baby, but you’ll probably also and that your new ‘job’ is very physically demanding. The demands of caring for small children mean exercise is the last thing many new parents have time for. OHbaby! fitness expert Renée Vincent gets honest about deconditioning and answers the awkward question of just how fit is unfit. Renee writes for OHbaby! magazine and this article was featured in the latest issue. You may be familiar with the Ministry of Health’s recommendation that you should aim to do 30 minutes of physical activity at least five times a week.